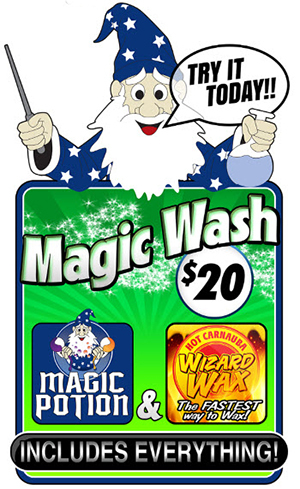 Welcome to Wash Wizard Car Wash, South Carolina's newest hi-tech car washes. Wash Wizard Car Wash provides an enjoyable car washing experience by offering a high quality car wash for a competitive price. Our state of the art equipment is easy to use and both our touchless automatic and self-service car washes accept credit cards providing more convenient payment options for fast and easy purchases. 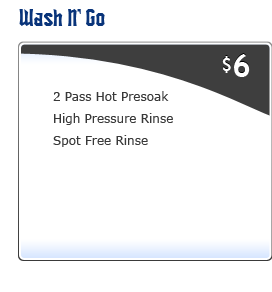 The first presoak pass effectively cleans and shines glass and chrome surfaces. It removes inorganic soils such as oils and road film. 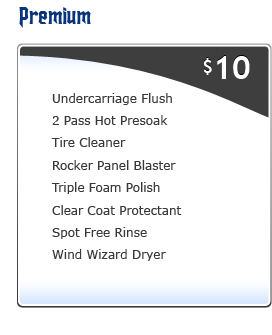 This premium presoak is a well-balanced blend of foam, alkalinity and solvent created specifically for frictionless cleaning in an automatic carwash. This non-corrosive formula gently penetrates and loosens road film, oils and heavy soils. The back and forth motion of the high pressure oscillating spray pattern attacks the dirt and grime from all different angles. Reverse osmosis separation technology is used to remove dissolved impurities from the final rinse water for a spot free finish. 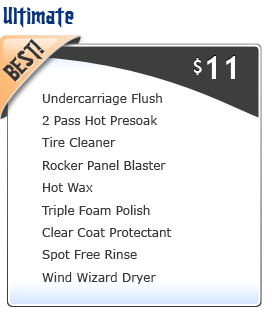 Provides a powerful spray on the under side of the vehicle to break away road grime. Provides a powerful spray on the sides of the vehicle to break away road grime. 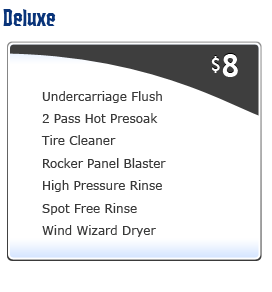 The high speed dryer utilizes concentrated high-velocity air columns to remove water from the vehicle surface. Tire Cleaner is a super-concentrated, fast-acting, high-foaming detergent with the power to penetrate and loosen road soil and brake dust on all types of wheel and tire surfaces. Produces exceptional shine on all vehicle surfaces, and helps to protect the clear coat layer from harmful ultraviolet rays. 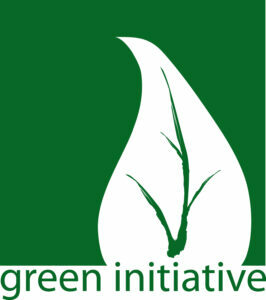 A concentrated, foaming, polymer-based protectant that coats the vehicle surface. This product aids in the protection of the clear coat layer from harmful ultraviolet rays, tree sap, bird droppings and acid rain. This product provides protection for all vehicle surfaces, including glass, chrome and painted surfaces and repels water on vehicle surface.